Last week was a home run. I was so excited to use the letterpress, and I finally got to do it! The story of the AADL's letterpress equipment in particular was fascinating. While it's true that equipment alone doesn't make up the maker movement, it's certainly an interesting historical and anthropological element. The fact that type is still made with lead was really interesting, and I was both surprised and not that there are professional letterpress repairmen. It was very cool to actually use the letterpress and the die cutter. I have a fascination with old printing techniques, in part because of their role in the spread of democracy. I've seen replica printing presses at Greenfield Village and Colonial Williamsburg, but haven't had a chance to use one. I hadn't realized how long it would take to typeset for the letterpress, so it was great to have Jody's pre-set type. Actually using the letterpress was incredibly simple. Other than inking the type, it required only a few simple movements. I could also see how easy it was to get an embossed effect, and it was interesting to learn how embossing used to be a sign of poor craftsmanship. I hope to get a chance to set my own type in the near future, and I'm curious to look into other ways of craftsmanship that are misunderstood or desired in incorrect ways. This week's readings were...interesting. I'm curious to see what the rest of the class makes of them. The common question I found myself asking was: what is the saturation point for making? How much room is there for makers in the economy, and at what point is the maker movement indistinguishable from plain old industry? The Brookings Institute was, unsurprisingly, extremely libertarian. The makerspaces they described sound a lot like schools and libraries, but those are *gasp* sponsored by the government! And we can't have that. Governments corrupt the purity of the grassroots maker movement. 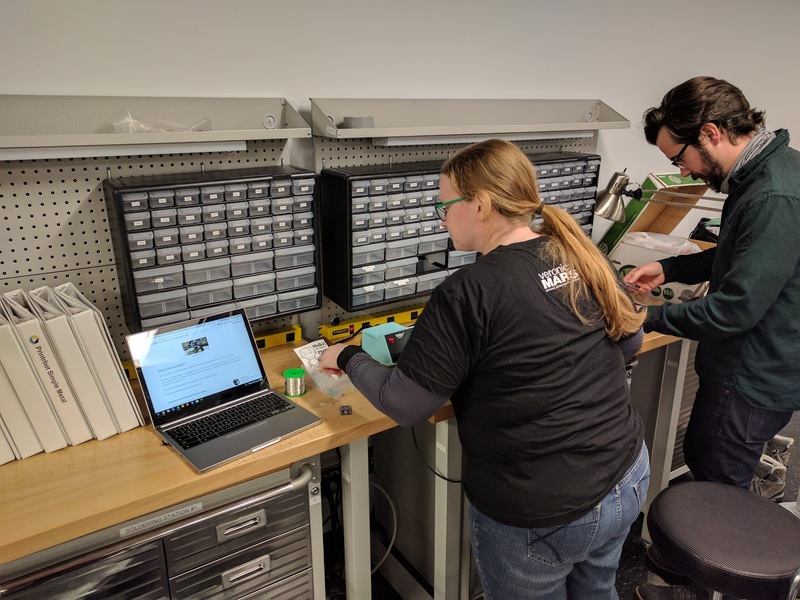 "As a common cause for maker spaces, community colleges, universities, and employers, the movement is helping deliver more relevant workforce development skills." Probably - but is that really the point? Dougherty's response didn't exactly disagree with Brookings. He clearly sees a bigger role for government, but doesn't really dispute any of their conclusions (like the heavy emphasis on marketability and capitalism). I had hoped for a stronger statement from him. Given Dougherty's emphasis on making and play, I was hoping he would disagree more with Brookings' stance. I certainly do at a personal level, but also at an academic and policy level. Fallows' interviews place his articles along a similar commercial line. FirstBuild Lab is very much a capitalist enterprise, and part of the "rebuild American manufacturing" (Popular Science) narrative. The 45th president of the US has made that a cornerstone of his policies, and President Obama, while less focused on it, gave speeches about similar issues (like robots and manufacturing). Fallows doesn't take a particular stance, but his sources all lead to a particular conclusion: making is here to stay, and it will save the American economy. For all the talk of making being the new industrial revolution, it remains to be seen how much making the economy can really support. On the one hand, manufacturing was historically either mass production or low volume, determined mostly by available resources and manufacturers' ability to get products to market while maintaining a reasonable margin. As Venkatakrishnan noted to Fallows, major manufacturers can support "low volume" production thanks to globalization, the Internet, etc. but it's unclear how much growth potential there really is. It reminds me a great deal of Doctorow's Makers, and I'll be interested to view the book through that lens. As before, I spent much of our class time soldering. I completed the header pins on two ESP8266 breakout boards. Beyond soldering, I made a BUTTON. I'm not sure I've ever been so proud of anything in my entire life. I ended up with a Calvin & Hobbes button perfectly centered on Calvin's face. As with the class before, the opportunity for self-directed work was valuable. 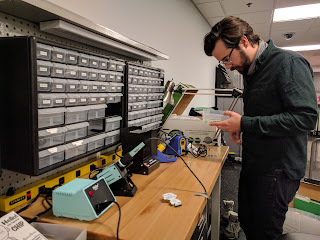 I ended up accidentally working solo due to the distribution of the soldering irons, but I could certainly have tried harder to work with others. Noticing my accidental "isolation" (I use quotes because I was only about 15 feet away from classmates and did not in any way feel isolated) did make me think about the physical design of makerspaces. In class we have frequently discussed the welcomingness (or lack thereof) of makerspaces, particularly regarding gender. Even if some have sewing machines or knitting supplies, they might be placed in such a way that they aren't part of the "real" makerspace or physically marginalize those using them. While this isn't exactly a surprise to me, my seating choice was nonetheless a helpful illustration. When I visit Makerworks I will specifically be looking at their facility design (perhaps making a map?) and see what activities are encouraged where. I particularly appreciated this week's focus on making and education. Many of Dougherty's stories rang true for me (making and creative work removed from schools, finding non-school opportunities to make) and I think he's really on to something about telling the story of making. I think there's a particular pedagogical benefit to focusing on the story of making, beyond building maker culture (198). Telling the story of how you made something encourages a deliberate practice of reflective learning, something I have anecdotally found helpful while teaching myself new skills. However, I also appreciated Halverson and Sheridan's perspective, perhaps moreso than Dougherty's. Dougherty writes for a general audience, but I think an academic analysis was both warranted and valuable. In particular, Halverson and Sheridan arrive at a broader understanding of making than Dougherty (whose definition can be meritocratic in an inequitable way) and conclude that while it can have a place in education it is hardly the silver bullet for education. One phrase that stood out to me and reminded me of something similar I wrote last week is "Makerspaces are the communities of practice constructed in a physical place" (502). The term "communities of practice" reminds me of Buddhist practice centers or Quaker meetings, and aligns well with my own experiences of making in the Secret Lab. Makerspaces are more than just the activities that take place there - there is a shared intention behind them that helps give them their power, without which they'd just be over-stocked workshops. It shouldn't be a surprise at this point, but I loved last week's class, like I do every week. It was fun to have a pretty self-directed class, and I really liked the creativity warmup. It was a helpful foregrounding for the self-directed portion to be able to do some basic messing around with inputs and outputs. In the latter portion of the class, Stephanie, George, and I spent time working on Soldering Sunday's Chip and Buzz kits. I re-learned soldering and shared some technique tips with the others. By the end of the class, the others had taught more classmates how to solder, and we had attached some LEDs and header pins. The remainder of the projects, including the onboard microcontrollers, will be finished this coming week. Even though I'm not the world's best solderer, I really enjoyed being able to share a little insight. And it was far more fun to make together than if I had just been working in my basement on the project. In fact, that's a consistent note from each class: I can see the value of a communal space to make in firsthand. I've been reading a lot about the value of Buddhist and Quaker practice in a communal setting, and there are more parallels than I'd realized between meditation and making. There is a special energy that comes from practicing or making in an intentional way with others who share your intention. This week was much lighter on reading, so I added some self-directed work of my own. I enjoyed Dr. Chuck's interview with Massimo Banzi, and felt the power of Banzi's enthusiasm for the community. I can see why he's become a leader in the maker movement - he feels warm, authentic, and excited to participate. I also was intrigued by how much he really believes in openness. So many times in the maker community "open" is just a buzzword thrown around, but Banzi is a strong advocate for truly practicing openness and he can show its success with Arduino. I also loved Becky Stern's video. She's my hero, and I'm probably going to make a button tomorrow that says "BECKY STERN IS MY HERO". She's just that cool. While watching the video and looking for Arduino tutorials, I also happened across her Internet Valentine Instructable, which is pretty cool. I found her video intriguing - my sewing skills are pretty poor, but I'd really like to try some projects combining sewing and electronics. It was obvious that the video was made relatively early on, and it doesn't have the production values of her more recent efforts. In my self-directed work, I messed around with an ESP8266 microcontroller I bought on Amazon for $8. The ESP8266 is similar to Arduino in that there's a family of microcontrollers calling themselves ESP8266, but quality and capability varies widely. The one I am using has WiFi and microUSB, and it was a royal pain to figure out the interface at first. Eventually, I discovered the MicroPython tutorial for the ESP8266. I knew I wanted to try MicroPython anyway, so I went ahead and flashed the chip. I had to try a few different methods to install the flashing software on my laptop (thanks, Linus) but once I had that part down actually flashing the device was easy. A few minutes later I was able to use my existing Python knowledge to blink the onboard LED in different patterns. Next up this week: hooking up the mini OLED display and temp/humidity sensor I bought and making a tiny wireless thermometer. I also plan to solder some header pins on the two other Adafruit-branded ESP8266 chips I have, for maximum prototyping!